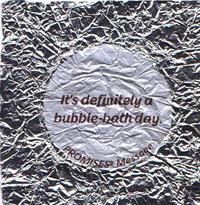 "It's definitely a bubble-bath day"
My husband brought this wrapper home for me yesterday - how perfect is that?!!! So, in trying to think of a reason to put it on the Inspirations, I thought of this page idea. Although it really is just my excuse to share this really cool wrapper, :) I think this would be an awesome page. If anyone does it, send it to me, and I will put it on the SBB Gallery! What was your grandmother's favorite candy? What was the first candy you ate after you went trick-or-treating? What is each of your family member's favorite candy? Find the wrappers for each person's favorite candy and either scan them in and print them on safe paper, or, just put the wrapper directly on the page beside the picture of the candy lover**. Talk about why they like it, how they discovered it, what they remeber about the candy as a child, etc. It would add neat embellishments and the wrappers and words would be preserved forever!